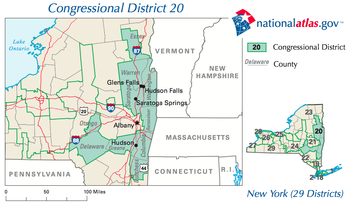 The New York 20th congressional district election for the 111th Congress was held on November 4, 2008. It was incumbent Democrat Kirsten Gillibrand's first run for re-election, and was one of the most expensive House races in the nation, with both campaigns spending a total of more than $9 million. Gillibrand defeated Republican Congressman John Sweeney in an upset in 2006. Representative Gillibrand faced businessmen Morris Guller in the Democratic primary due, it was said, to her support for a supplemental appropriation for the Iraq conflict. Gilibrand won the primary by a wide margin. Treadwell, with the backing of the State Conservative Party and the GOP, filed Requests for Judicial Intervention to disqualify Wallace and Rocque from the primary. He succeeded, and became the sole opponent of Kirsten Gillibrand. Gillibrand faced Republican Sandy Treadwell, former Secretary of State for New York. On October 10, 2008, the Cook Report listed the 20th District as "Likely Democratic". Gillibrand won the November 4, 2008 election with 62% of the vote to Treadwell's 38%. ^ "Gillibrand, Treadwell spending millions". The Daily Gazette. 28 October 2008. Retrieved 18 October 2008. ^ Ilan Wurman (May 31, 2007). "Vote on Iraq funding bill triggers primary challenge for Gillibrand". TheHill.com. Retrieved 2008-02-15. ^ Maury Thompson (January 16, 2008). "Warren County to endorse on Thursday; Mechanicville GOP endorses Wager; Gillibrand votes for military pay raise". The Post-Star. Retrieved 2008-02-15. ^ "2008 Election Results". New York State Board of Elections. 2008-12-04. Retrieved 2011-01-26.